Launched last year the E-510 was a 10-megapixel delight that came with a pack of features, including an anti-shake facility, anti-dust mechanism and Live View instead of a traditional viewfinder. 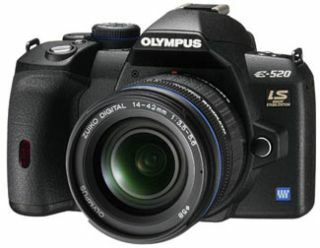 Its successor was announced by Olympus today, the E-520, which may not a radical overhaul of the E-500 range, but it is a worthy update. Even though the chassis is unchanged, under the bonnet sees some significant tweaks. First up is an improvement with Live View. This feature has been given autofocus capabilities, making it easier to take picture-perfect images - this was first seen on the E-420. Olympus has also added face detection to Live View. The E-520 now houses a 2.7in LCD screen, up 0.2in on the E-510, and the camera’s continuous shooting speed has been upped 0.5fps to 3.5fps. Lastly, there’s been an update to the processor which brings the ISO rang up from 100 to 160, cutting visual noise to an absolute minimum. The E-520 is out in June and will cost £479.99 (body only). You can also buy the camera with a ZUIKO DIGITAL ED 14-42mm 1:3.5-5.6 lens for £529.99.